In theory and practice, the notion of fairness is far from simple. The principle is often elusive and subject to confusion, even in institutions of law, usage, and custom. In Fairness, Nicholas Rescher aims to liberate this concept from misunderstandings by showing how its definitive characteristics prevent it from being absorbed by such related conceptions as paternalistic benevolence, radical egalitarianism, and social harmonization. Rescher demonstrates that equality before the state is an instrument of justice, not of social utility or public welfare, and argues that the notion of fairness stops well short of a literal egalitarianism. Rescher disposes of the confusions arising from economists' penchant to focus on individual preferences, from decision theorists' concern for averting envy, and from political theorists' sympathy for egalitarianism. 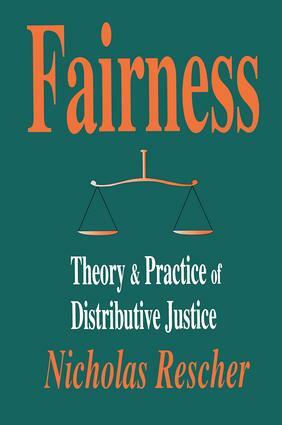 In their place he shows how the idea of distributive equity forms the core of the concept of fairness in matters of distributive justice. The coordination of shares with valid claims is the crux of the concept of fairness. In Rescher's view, this means that the pursuit of fairness requires objective rather than subjective evaluation of the goods being shared. This is something quite different from subjective equity based on the personal evaluation of goods by those laying claim to them. Insofar as subjective equity is a concern, the appropriate procedure for its realization is a process of maximum value distribution. Further, Rescher demonstrates that in matters of distributive justice, the distinction between new ownership and preexisting ownership is pivotal and calls for proceeding on very different principles depending on the case. How one should proceed depends on context, and what is adjudged fair is pragmatic, in that there are different requirements for effectiveness in achieving the aims and purposes of the sort of distribution that is intended. Rescher concludes that fairness is a fundamentally ethical concept. Its distinctive modus operandi contrasts sharply with the aims of paternalism, preference-maximizing, or economic advantage. Fairness will be of interest to philosophers, economists, and political scientists.